Mamata Banerjee�s chosen Railway Minister Mukul Roy promptly repaid her debt at the first opportunity today by rolling back the hike - announced recently by Dinesh Trivedi in the Rail Budget - in train fares for not just the general second class, but also for AC chair car and AC three-tier sleeper classes. Faced with intense pressure from political parties in Tamil Nadu, the UPA government today voted in favour of a US-initiated resolution at the UN Human Rights Council (UNHRC) in Geneva, urging Sri Lanka to �credibly investigate� allegations of rights violations during the prolonged conflict against Tamil Tigers, a move which could have a bearing on relations between the two South Asian nations. The Punjab Government seems to be buying time in persuading Balwant Singh Rajoana, the assassin of former CM Beant Singh, to challenge the death sentence against him. The Ministry of Commerce here on Wednesday issued the Statutory Regulatory Order (SRO) for switching over to negative list regime to trade with India. According to the notification, as many as 1,209 items have been included in the negative list and would not be importable from India to Pakistan. Readers of Jammu will have a new supplement, Jammu Tribune, starting from tomorrow, Saturday, March 24, 2012. The Tribune, with this pull-out, will provide the readers of this region additional local coverage as well as many new features. One person was killed and at least 11 others, including three CRPF constables, were injured in a powerful car bomb blast at Bijbehara in Anantnag district of south Kashmir. �The identity of the deceased could not ascertained as the body has been mutilated,� a police official said. Inspector General of Police, Kashmir, SM Sahai said the car in which the blast took place had been going from Anantnag to Srinagar. A day after receiving drubbing in the byelections, rebellion broke out in the ruling Congress in Andhra Pradesh with the sulking minister Dr DL Ravindra Reddy quitting the Cabinet �owning moral responsibility� for the poll debacle. The daggers were out in the ruling party camp with several senior leaders openly demanding the resignation of Chief Minister N Kiran Kumar Reddy and PCC Chief B Satyanarayana for the party�s poor showing at the hustings. Dealing a blow to an Indian couple battling for custody of their children, Norway's Child Welfare Service has said the kids cannot go back to India, where they can be caught up in "a very unfortunate tug of war" in the wake of differences between their parents. 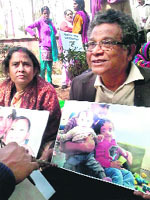 Grandparents of Abhigyan and Aishwarya during a protest.